When I send my Drill tools sizes are they before or after the plating? The drill tools sizes are assumed the drill tool sizes for drilling. After the plating in double side PCB the finished hole size will be -0.1 mm. i.e. 0.7 mm drill size will produce 0.6 mm final hole size. You should take this into account when you design your board. The general rule of tumb when you design your custom library parts is that if your component lead is X mm your drill hole should be X+0.3-4 mm i.e. if your component lead is 0.4 mm you must provide 0.7 - 0.8 mm drill hole, if you make the clearance bigger you will have more waste of solder when soldering and you may not fill your pads properly, if you make the clearance smaller you will have problems when you stuff your components. It is possible to have non plated holes in my double side board? No. All holes are to be plated. 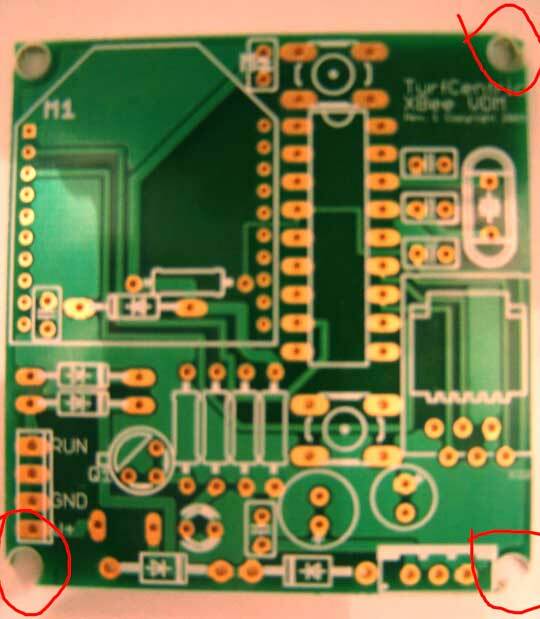 If you send us PCB files with split plated and non-plated holes files, the non-plated holes file will be ignored. What is your minimum drill size I can use in my design? What is your maximum drill size I can use in my design? What if I use under 0.6 mm in my design and I send it to you for manufacturing? We'll not process your files and notify you that you can't use under 0.6 mm drill size in your design. What if I use over 5.0 mm in my design and I send it to you for manufacturing? If I use 0.6 mm drill size what is the minimum pad diameter? 1.06 mm which produce 0.203 mm annular copper ring (8 mils). I'm sending you my files. Can you substitute the drill sizes in my Drill file to your standard drill sizes? No. We don't alter customer files. Increasing drill sizes outside your CAD program almost always create annular ring violations in DRC check, decreasing drill sizes may cause problems with your component stuffing, so if you want to use standard drill sizes just design your board with these. What drill sizes can I use in my design? Can I use inch sizes? Yes, you can use inch sizes, but note that we work in metric units and we have drill sizes from 0.6 mm to 5.0 mm in 0.1 mm steps. This means that if we receive your drill sizes in inch units we'll convert to metric and round to 0.1 mm. For instance if you are using 27 mils, 28 mils and 29 mils drill sizes they all will be rounded to 0.7 mm. To convert from IMPERIAL to METRIC you should divide your IMPERIAL drill size to 39.37 i.e. 130 mils / 39.37 = 3.3 mm and vice versa 1.0 mm = 39.37 mils after rounding = 39 mils. If this rounding is not taken into consideration you can easily make DRC violations - for instance you can use 34 mils drill with 50 mils pad/via which should pass the annular ring copper check as the pad-drill is 16 mils, but 34 mils drill = 0.86 mm will be rounded to 0.9 mm and the 1.27 mm pad/via will fail on the DRC check. My can generated too many non-standard drill sizes when I process my board, may I manually adjust them to your standard drill sizes? Please DONT MANIPULATE YOUR DRILL HOLES OUTSIDE YOUR CAD PROGRAM - this is very often error made by not experienced Eagle users, in the aim to use only standard drill szies they manually increaseing their holes after they generate Eagle NC drill files, this is totally wrong approach as always leads to annular ring violations and your board will be not produced. If you want to use standard drill sizes please make this in your CAD and do DRC check to make sure that your board design is error free. Is there way I can make my Eagle libraries with Olimex standard drill sizes? How close can I place drill holes to board edge? You can place the holes wherever you want, but the drill hole should not overlap with the border, i.e. we can't cut through holes. Also something very important is that if the drill hole is closer than PCB laminate thickness there is great chance during the de-panelization this thin wall between the drill hole and border to get broken, click HERE to see example of customer who placed 3.2 mm drill hole at 1.9 mm from board edge (making 0.3 mm gap between drill hole and border on 1.5 mm laminate thickness). Note that this is not DRC violation i.e. you can desing your board this way, just if you require de-panelization your holes will be broken.